Situated where northwestern Africa bulges into the Atlantic Ocean, The Gambia, with less than half the land area of New Jersey, is the smallest country in continental Africa, and one of the poorest. With a population estimated at 1.5 million, it occupies the flat, savanna country on the north and south banks of the River Gambia. It is less than 28 miles wide. Legend has it that the borders were established as the range of a cannon-shot from a ship on the river. The river is a massive, leonine presence. Home to pygmy hippos and a subspecies of Nile crocodile. Rich with fish, it carries its 700 mile length with sinuous power from its origin in the Futa Jalon highlands of Guinea, through part of Senegal, to its mouth at the Atlantic Ocean at Banjul. There it is seven miles wide, seeming less like a river than an inland sea. From either Banjul on the south or Barra on the north the other side is more “a far shore” than a river bank. Not much is known about The Gambia’s ancient populations and little archaeological research has been done. Prehistoric stone circles still stand that are estimated to be up to a thousand years old. The area was an early terminus for the trans-Saharan trade. Arab and Berber traders from the Middle East and North Africa took away gold, ivory, and slaves and brought textiles, salt, beads and…Islam, which took hold in the 11th Century. The area around the Gambia and Senegal Rivers was part of the Mali Empire from the 13th through 16th Centuries and Mandinka rulers were dispatched to the Senegambia from the areas of what are now Guinea and Guinea-Bissau to the south. In the 15th Century the Portuguese began a lucrative trade with the indigenous people. The Portuguese sold their trading rights on the Gambia River to the English in the 1680s. For 200 years England vied with France for control of trade in goods and slaves in the area. This was finally settled at the Treaty of Versailles in 1783 and The Gambia became an English colony. Trade was lucrative. More than 2 million slaves are estimated to have been shipped out of the Gambia River. England finally desisted from this traffic in human misery in 1807 and tried to stop the slave trade on the river, perhaps motivated more by national and economic rivalry than by humanitarian concerns. They established Bathurst on St. Mary’s Island in 1816 and emplaced a battery of six 24-pounder guns to interdict the river mouth. Borders were firmly established by treaty with France in 1888, probably at the Treaty of Berlin that carved up West Africa among the European Colonial Powers. Of course, the native peoples had no say in this. The Gambia achieved independence from England in 1965 with a constitution and an elected president the next year. The president, Dawda Jawara was overthrown in a military coup in 1994. One of the leaders, an Army lieutenant, became president and is now His Excellency Sheikh Professor Doctor Colonel Yahya A.J.J. Jammeh. Agriculture and fishing are the mainstays of the economy and the tourist industry brings in much-needed foreign capital. Brits, Dutch, Danes, Spanish, French and Finns come to take advantage of the beaches in the winter when the climate is dry and delightful. Ground nuts (peanuts) are the major export. The Gambia is a major transshipment point for all sorts of goods from West Africa. The fishing industry has been gradually taken over by fishermen from Senegal. Tons of fish, both fresh and smoked, are exported to neighboring nations yearly, though, according to a recent National Geographic article, fishermen are having to range farther and farther offshore as coastal waters are increasingly depleted and global warming takes its toll. 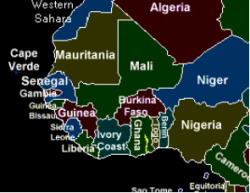 The Gambia is one of the poorest countries in Africa. The average family subsists on about the equivalent of $1 a day. Crocodiles and hippos inhabit the upper Gambia River. There are several varieties of monkeys, baboons, pythons, and Nile monitor lizards. Hyena packs roam the bush at night. Bush buck can be seen in some of the nature reserves. I am told that in remote areas there are still wildebeest and leopards. The Gambia is on a major migration route and boasts well over 400 species of birds. Birdwatchers from all over Europe come to The Gambia in the winter to view and photograph the wide variety of wildfowl. Seven different tribes inhabit The Gambia. The Mandinka are most numerous but are outnumbered in the capitol by the Wolof, who migrated from Senegal, mostly in the 19th Century, fleeing the Marabout Wars. The Fula (Fulani, Peul, Pulaar, Fulbe) are spread all across The Gambia, as they are all across this latitude of Africa. The President’s tribe, the Jola, who may be the oldest tribe in the country, primarily live to the south where they overlap the border into the Casamance region of Senegal. An admixture of Serahule, animist and Christian Manjiago, and Serrer, round out this complex mosaic of cultures. There are also a group called Aku. These are descendants of slaves returned to Sierra Leone from England in the early 19th Century. They are Christian and speak krio. All these groups live in peace among each other.